Washington Grove has two forests, each very different from the other and each comprising more or less 50 acres. The woods, both East and West, are open to all with few regulations. Fires, of course, are out of the question. Please do not bring motorcycles, cars or trucks into the woods. Most of the other requests are posted around the woods. Enjoy! The West Woods, the one across Washington Grove Lane from the main town, is composed for the most part of mature tulip Poplars. In late October, these present a sight that is not to be missed. Other than a few oaks, an occasional wild cherry and hickory, most of the other trees are medium-sized dogwood, the occasional mulberry, plus many, many shrubs in the 8 to 15-foot range, mostly honeysuckle. In early summer, wineberries can be picked and eaten on the way to the lake. While still quite prevalent, poison ivy is not nearly the problem here as it is in the East Woods. Two springs, the only naturally-occurring springs in town, are also to be found in the West Woods Both of them run in late winter and early spring on a fairly consistent basis. The more westerly of the two, the one closer to the Gaithersburg Ball Field, dries up by midsummer unless there is more rainfall than usual. The other spring, Maple Spring, feeds into Maple Lake. Wildlife in this area consists of the usual indigenous birds, squirrels and a few deer. In winter and spring, ducks and geese sometime stop at the lake and occasionally nest there. The East Woods is far more diverse in many ways. The trees are for the most part oaks, with hickories, mulberries, wild cherry, maple holly, and box elder making up the rest. Many of the flowers, some of the shrubs, and probably even some of the trees were yanked from a yard at some time in the town’s history and dumped in the woods, where they took root and grew. In the summer months, a few snakes (no poisonous ones have been sighted) and many box turtles can be found by looking in the damp areas. Lots of deer are seen by those quiet enough and patient enough to wait them out. There are more birds in the East Woods than in the West Woods. The Town has been lucky enough for the past few years to have mating pairs of pileated woodpecker, and great horned owls. The East Woods also has more than its share of green briar and poison ivy. In spite of this, it seems more open and more like a traditional eastern woods than the West Woods which seems darker and more oppressive, particularly in the summer when the air is hot, quiet, and still, with hardly the sound of a bird moving through the silence of the under-canopy. 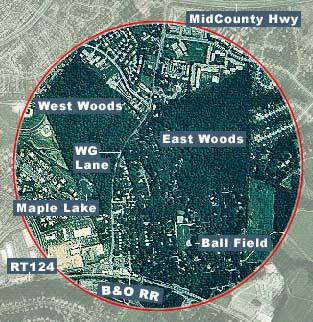 The East Woods was originally planned to have homes much the same way as the main part of the town. There are even water mains and fire hydrants in place, and storm water drainage systems, but the plans went no further than that and the placement of the roads. These “roads” are now nothing more than walkways which are kept open to allow easy access to the woods by walkers and nature lovers, and should it ever be necessary, by fire equipment.